“Taiko Nation” will be presented on Saturday, July 19, at 8 p.m. and Sunday, July 20, at 2 and 7 p.m. at the Aratani Theatre, 244 S. San Pedro St. in Little Tokyo. The world’s top taiko ensembles and performers share the stage for the first time together in this concert program that is part of the 2014 World Taiko Gathering. 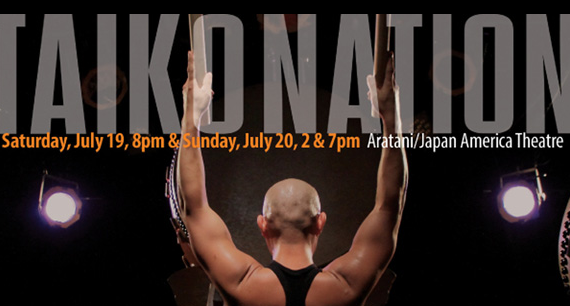 Hailing from Europe, South America, Japan, Australia, and the U.S., these drummers will shake the stage with their shared taiko passion and energy. Featured artists include Kagemusha Taiko (Exeter, U.K.), Taro Kobayashi (Tokyo), members of TaikOz (Sydney, Australia), Chieko Kojima and Eiichi Saito (Sado), Kaoru Watanabe (New York), Yakara (Sendai), and TaikoProject (Los Angeles). In addition to this stellar line-up, surprise guest performers will join in for a bombastic opening collaboration and a spectacular closing finale. Reserved seating is $35 for orchestra, $30 for balcony. For more information, call (213) 628-2725 or visit www.jaccc.org.